Designed for cleaning of different types of surfaces such as utensils, tiles, wash basins etc. Made using quality grade fiber cloth to ensure effective scrubbing and cleaning. Brings shine to the objects after scrubbing. Ensures hygienic use. We are one of the pioneers in the field of Scourers. We put together scrub sponge for cleaning of kitchenware. 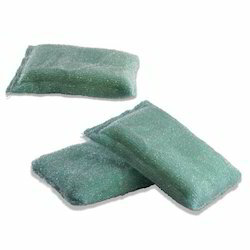 Our scrub sponges provides both absorption and cleansing action with a variety of scouring levels. These are very effective on difficult stains. They are highly effective in non-stick cookware. Available in various shapes and sizes, we make scrub sponges that match the needs of all types of households. We are engaged in offering Scrub Sponge (Two-In-One) is a utility tool with scrub pad on one side and sponge on the other. This is ideal for cleaning crockery and glassware. You are not required to have multiple tools to clean multiple type of vessels. One scrubber that addresses most of your need. Owing to the years of industrial experience, we have been able to serve our valued clients with a wide range of Sponge Scrub. Following the industry defined quality parameters, this sponge is manufactured using quality tested raw material and advanced technology. This sponge is highly demanded for its softness and best quality. We are one of the best organizations in the market, involved in offering a wide collection of 3 in 1 Super Scrub Sponge to the customers within the stipulated frame of time at very affordable rates. 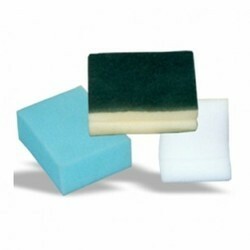 After huge appreciation of clients, we are making available Heavy Duty Scrub Sponge at very reasonable price.